Students and artists have the privilege to truly think out of the box, to push the technological boundaries far into the future. Whatever is thinkable will be translated into objects that stimulate, challenge and inspire the rest of the world to achieve their visions one day. I work hard to find these visionaries in the field of wearable technologies, technologies that add functions to clothing we often desire but hardly can imagine to find in our wardrobe one day. One of the most amazing I have come across although reaching far into future of technology enhanced garments is the creation of a team of students at the Shih-Chien University in Taiwan, Yu S Pai, Dudley and Hsu. The style of the dress is made along the lines of robotic design lines with illumination elements. The real creative gem stone is in the material of the dress, made of a fully textile based dispaly. 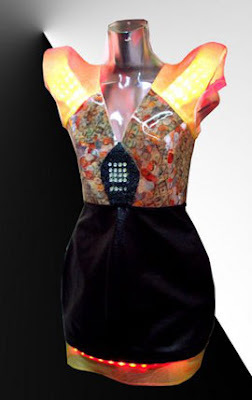 On the back of this futuristic dress is a camera integrated. When activating the camera the fabric of the dress will display what is going on behind the wearer. Somebody standing in front of the wearer will be able to see-trough that person, making her invisible, or almost invisible. Unfortunately this advanced textile display technology is not yet available but as I had reported earlier, high profile projects are looking into the feasibility of it. If these projects can deliver on their ambitious plan these students might very well see the invisibility dress become reality. I have seen various research projects looking into technologies for the invisibility cloak, most of them work on reflection or light absorbing materials or coatings. The invisible dress design from these students takes a complete different approach, an approach which might allow us to create clothing to see through, to make the wearer invisible with the push of a button.